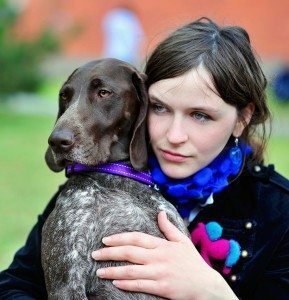 Hi, German Shorthaired Pointer (GSP) lovers. I am Migle Narbutaite – GSP lover and breeder. I’m also a photographer and photography lecturer. My experience in “dog life” spans over 15 years. I began as a Junior Handler, handling dogs all over Europe. Eventually I ended up training and breeding what I consider the most incredible breed on earth – German Shorthaired Pointers. In my own breeding practice, I have high standards and breed on a very limited basis, with each litter carefully planned well in advance. All the combinations I plan involve dogs with many years of selective breeding on their pedigrees, only the best show results, and excellent health and endurance that have been proven in the field. I believe that strict compliance with these requirements produces healthy, brave and intelligent dogs with a correct build and great hunting instincts. Every step of the way, I get tremendous support from my wonderful partner and boyfriend. If not for him, this blog wouldn’t be possible, so Bogdan, big thanks to you! During all those years being very personally involved into the dog-life got to know very brilliant people, breeders and judges, who let me grow as a scrupulous breeder first to myself. Now I get many letters via e-mail or Facebook with various questions and even warm compliments. Most of the questions are actual to big audience of people, so I decided to make it online and give to people professional information about training, hunting, health problems, travels, games, food, swimming, communicating and much more. Many subjects will be unravel here, thats why specific articles will be written by different persons, who are well experienced or/and professional in their skills. I regularly post articles on various topics that are relevant for GSP lovers. I share professional information about GSP health, hunting features, training, anatomy, coloration, interesting upcoming dog shows in Europe, information about the biggest shows worldwide, and much more. Some of the articles I write myself. Health articles are written by respected veterinarians, and hunting subjects are taken on by experienced hunters, trainers and breeders. The blog itself. I invite you to visit the blog regularly and get fresh material about GSPs. The RSS feed / Email feed. If you use RSS readers like Google Reader [link] or if you would like to receive updates when I publish a post, please subscribe at the top right corner of the blog. The newsletter. In my newsletter I will regularly share useful information about GSPs, tips, “how to” guides and more. Go ahead and sign up for the newsletter in the right sidebar of the blog. Facebook. Yes, Facebook. This is where the idea for my blog began, so I will definitely keep it alive. Become my friend at fb.com/gsp.upe. In order to get the most out of this blog, I encourage you to interact with it so we can start interesting and useful discussions: leave comments on posts and on the Facebook page, and write me emails. I believe that you can get the most benefit from a blog only when there is a two-way communication.